Robinson was born in Jackson in East Feliciana Parish, Louisiana, to the son of a sharecropper and a domestic worker. He went on to graduate from McKinley Senior High School in Baton Rouge in 1937. He went on to earn his bachelor's degree from Leland College in Baker in East Baton Rouge Parish, then obtained his Master's degree from the University of Iowa in Iowa City in 1954. Robinson is a member of Alpha Phi Alpha fraternity. 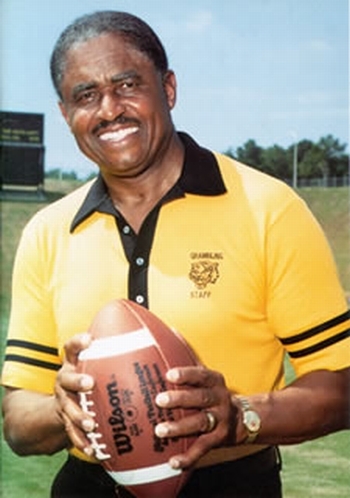 After serving more than fifty years as the head football coach of Grambling State University, Coach Eddie G. Robinson retired from his position at the end of the 1997 season at the age of 78, closing the book on what can be described as the most illustrious college football coaching career ever. With 408 wins, Robinson is considered the "winningest" coach in collegiate football history. 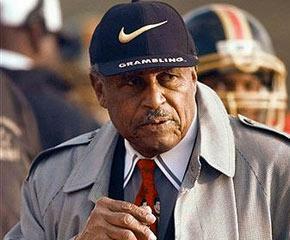 In addition, his 56 years at Grambling comprise the longest coaching career at one college. He holds the record for the most games coached with 588, and he never missed a scheduled game. Robinson received the National Football League Players' Lifetime Achievement Award in 1998 and has been inducted into seven sports halls of fame, including the College Football Hall of Fame in 1998 when the three-year retirement mandate was waived to allow his immediate induction.